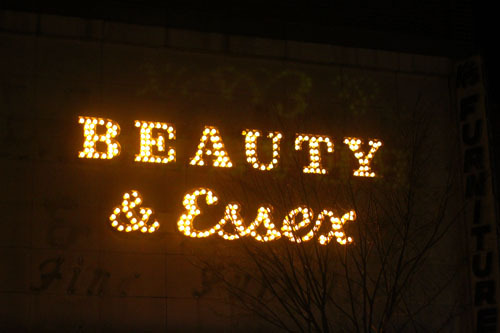 Beauty & Essex is a sleek new girls'-night-out (guys seem to like it, too) spot in the LES. Soft lighting, plush velvet banquettes, chandeliers, vintage perfume bottles, crystal, mirrors and all of sparkly décor bits that the chicks dig are hidden behind this multi-level restaurant/lounge/bar's pawn shop façade. The food is good, a lot of it is even better than good (I'm looking at you tomato tartare), the service is friendly, the people are pretty, and the cocktails are delicious. Oh yeah, the best part: Ladies' (complimentary!) Champagne Lounge. I hear it gets crazy down there. I'll be back.